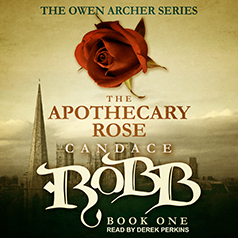 Both The Apothecary Rose and The Lady Chapel are now available from Tantor Audio in the US, with The Nun’s Tale coming in December! 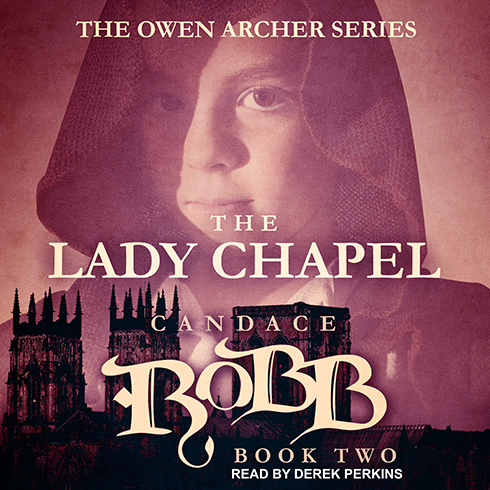 When Tantor Audio offered an audiobook contract for the first three Owen Archer mysteries, I scoured their list of narrators for the one I thought might be the best match for the series, and proposed the award-winning Derek Perkins. I am so pleased with the results. Derek not only creates distinct voices for each character, but he gives a deeply nuanced reading that never strays from my intention. What a gift! Perfect for holiday gifts! 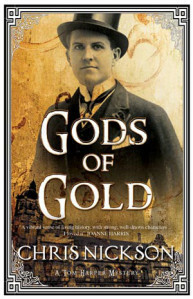 And downloadable on Audible. 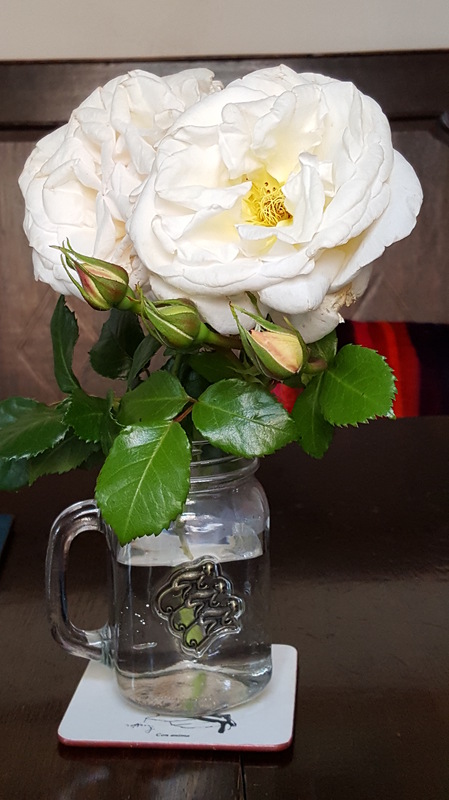 The second rose is this gorgeous one, which Jane Hibbert brought me, fresh from her garden, as she arrived for my talk in the Festival of Ideas in York last month. Called Minster Rose, it has the most exquisite scent. Thank you, Jane! I believe this is the York Minster Rose bred especially for a minster fundraiser, or so I was told by Richard Shephard as I set it out on his kitchen table. Perfect! I just wish I might have brought it home. But I’m going to hunt it down. It will look beautiful beside my apothecary rose and in front of my climbing City of York, a white rose (of course!). The third rose is a rosewood fountain pen made from the remnants of some old rosewood furniture by Bob Newman, a thank you for the Owen Archer books, particularly The Apothecary Rose. This will have pride of place on my desk. Isn’t it beautiful?! Here’s a link to a guest post I wrote for the blog, Raven-Haired Girl. I reused a title from a talk I gave at York St. John University six years ago, but that’s where the similarity ends. I had fun with it! I mention the mortar from St. Mary’s Abbey. Here’s a photo–the beautiful pattern isn’t as clear as I’d like, but you can see the size of it. Sadly, I didn’t copy edit the post as carefully as I should have. Two typos jumped out at me as I read it the morning it was posted. Can you spot them? While you await the publication day of A Triple Knot, I thought I’d share with you the paper I presented at the most recent International Congress on Medieval Studies. The session was The Real Generic Middle Ages, sponsored by the Tales After Tolkien Society. It’s long, but if you’re curious why I move back and forth between genres, well, here’s the inside scoop. Even before I read John Crowley’s magnificent novel, Little, Big, or the Fairies Parliament, I understood the concept evoked in the title, or, at least, one of the concepts, because of Dr. Who’s TARDIS. As doubtless most of you know, the TARDIS, or Time And Relative Dimensions In Space, is the Doctor’s, and all Gallifreyan Time Lords’ method of traveling from then to now. Dr. Who’s TARDIS appears as an English police box on the outside, thanks to its chameleon circuit having been jammed on earth in 1963, but within, it’s an enormous ship with many rooms. Rather like the house in Edgewood in Crowley’s novel, a pentagon with five individual façades, so that from each front one has the impression of a much smaller, far more organized interior than exists. The illusion of the outer shell hiding a vastness within. Or how it really is. By which I mean, the depths we discover when we delve beneath a façade. Which is what I’m after in recreating the 14th century, what I seek in research. My books are my TARDIS, my method of traveling from now to then. Let this introduction serve as a caution about creative titles—they take on a life of their own. The very thing that happened once I settled on a title for the Owen Archer novel I’m writing, A Rumor of Wolves—which suddenly had me pulling books off the shelves relating to wolves, werewolves, and The Master of Game, Edward of Norwich’s book based on Livre de chasse by Gaston Febus, Count of Foix. But it all began with a pack of dogs baying in the night. And that, in a remarkably roundabout way, brings me to what this paper is actually about—the contrast between writing historical crime and mainstream historical, as I experience it. When I proposed this paper I thought my point would be best illustrated by listing what books I pull off the shelves while working on a manuscript. I’d start with the different piles for my forthcoming book, A Triple Knot, about Joan of Kent’s early marriages, and my current work- in-progress, the Owen Archer mystery, A Rumor of Wolves. For A Triple Knot, the reading list included: the first two volumes of Jonathan Sumption’s The Hundred Years War, Mark Ormrod’s Edward III, Juliet Vale’s Edward III and Chivalry, Malcolm Vale’s The Princely Court, two Clifford Rogers volumes—War Cruel and Sharp and The Wars of Edward III, Munby, Barber and Brown’s Edward III’s Round Table at Windsor, Caroline Dunn’s Stolen Women in Medieval England, Michael Sheehan’s Marriage, Family, and Law in Medieval Europe, Francis Ingledew’s Sir Gawain and the Green Knight and the Order of the Garter, Juliet Vale’s and Mark Ormrod’s articles in St George’s Chapel Windsor in the Fourteenth Century, Hugh Collins’ The Order of the Garter 1348-1461, and unpublished dissertations on Joan of Kent, the Holland family and the Montagus. 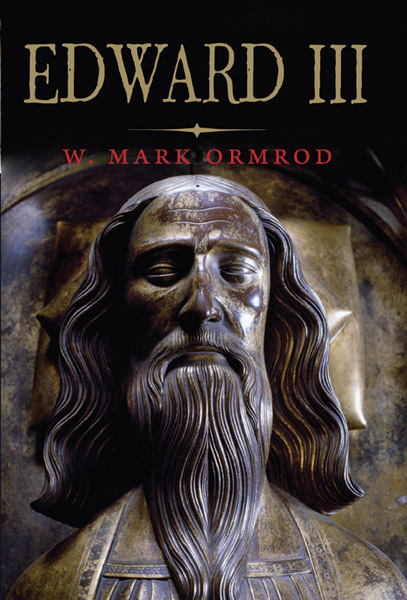 As you can see, mostly about Edward III’s court, his wars, his Order of the Garter, the key noble families in Joan’s life, and what makes a legitimate marriage in the 14th century. This is certainly not an exhaustive list, but gives the flavor of my pile. For A Rumor of Wolves, the reading list includes (so far) The Master of Game, as I noted, Wolves and the Wilderness in the Middle Ages by Aleksander Pluskowski, Matthew Beresford’s The White Devil: the Werewolf in European Culture, George Bensen’s Later Medieval York (great maps), Angelo Raine’s Medieval York, R.F. Hunnisett’s The Medieval Coroner, Jenny Kermode’s Medieval Merchants: York, Beverley and Hull in the Later Middle Ages, Anne Van Arsdall’s Medieval Herbal Remedies, Stephen Pollington’s Leechcraft, and Healing and Society in Medieval England by Faye Marie Getz—again, just a sampling. I know it’s difficult to hear such lists and organize them in your mind, but let me point out that nothing that even remotely smacks of nobility or the court shows up on this second list. It’s all about dogs, healing (especially of dog bites but also other complaints), merchants, York, wolves, and superstitions about wolves. But the difference in research is not just what sources I use, but how I use them. Of course I share research between the two genres. 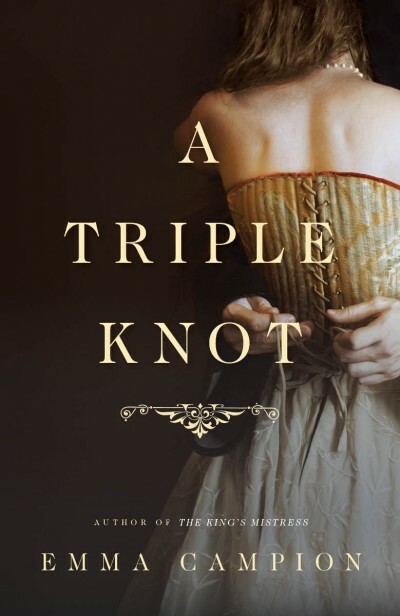 Why would I need to pull out books about the royal family when I’ve been living in their midst for 3 years writing A Triple Knot? But what I need to know can be quite different for the two genres. The early years of the Hundred Years War are always in the background in the Owen Archer novels. It was in Normandy that he lost the sight in his left eye. He’d fought under Henry, Duke of Lancaster, and was proud of that. But when I approached those years to write about Thomas Holland and the ransom that provides the money to go to Avignon and petition the pope to honor his vows with Joan, I needed to know far more about the battles and the politics behind them. Hence reading Sumption’s books. I don’t mind more research. I love the research! It was great fun to explore Antwerp, Ghent, and the politics of the Low Countries, as they were called. Quite an eye-opener for me. But in writing the novels about Alice Perrers and Joan of Kent I quickly came up against limitations I hadn’t prepared myself for, which, with a little mindfulness, would have been clear from the start: when the central character is someone who actually lived, I’m not nearly as free to choose the direction of the story and with whom my characters can interact than I am with my fictional detectives. This takes me back to what felt like dismal advice in 1988, but turned out to be a gift. 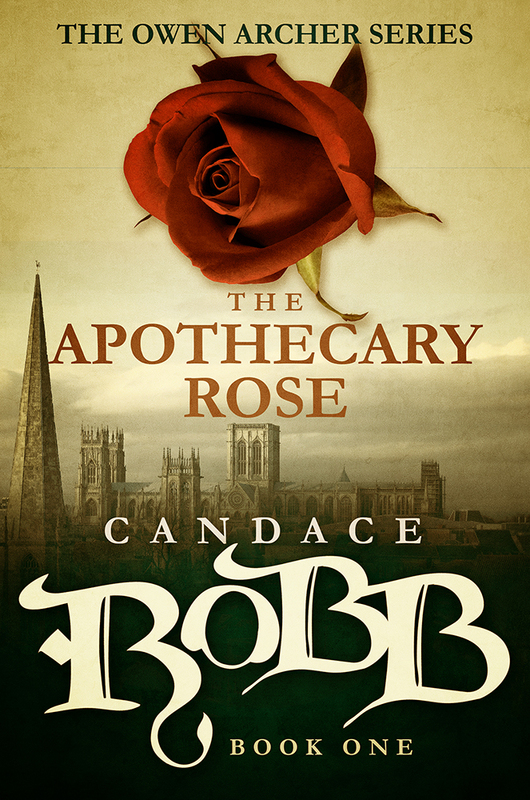 When I began the story that eventually became my first published book, The Apothecary Rose, it wasn’t a crime novel. There was no Owen Archer in my plan. I meant to begin with an apothecary’s wife in 14th century York and then expand out into a big fat saga about the Hundred Years War and the siege of Calais. But as I wrote I became so interested in portraying the lives of everyday people in York that the Calais story receded into the background. I felt as if I were, in a small way, recreating what it was like to live a simple life more than 6 centuries ago, like Tolkien’s vivid depiction of wayfaring life in the middle ages. 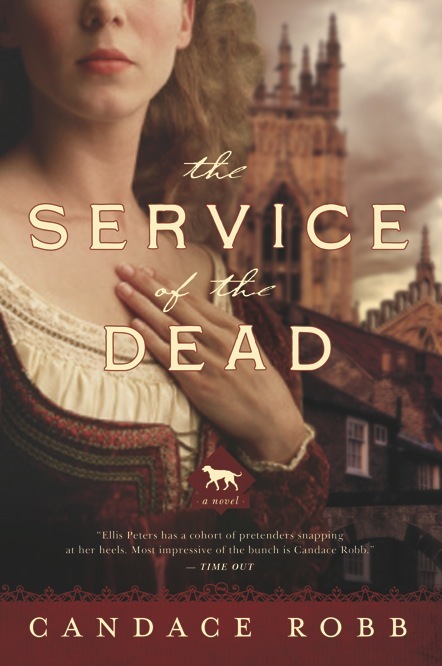 An agent’s reader advised me that it was a period piece, and would be a tough sell unless it was a romance or a mystery. 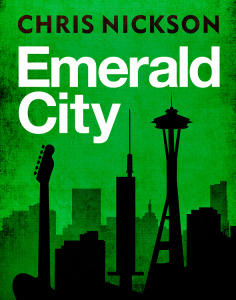 Eventually I took her advice and rewrote it as a crime novel. Reluctantly, because I expected to feel constricted by the format. But I discovered that within the general outline of crime-investigation-solution I was quite free. With each novel I explored topics in 14th century England that interested me, something fresh for each book. In The Lady Chapel it was the mystery plays, town waits, and King Edward’s manipulation of the wool trade to fund his war. 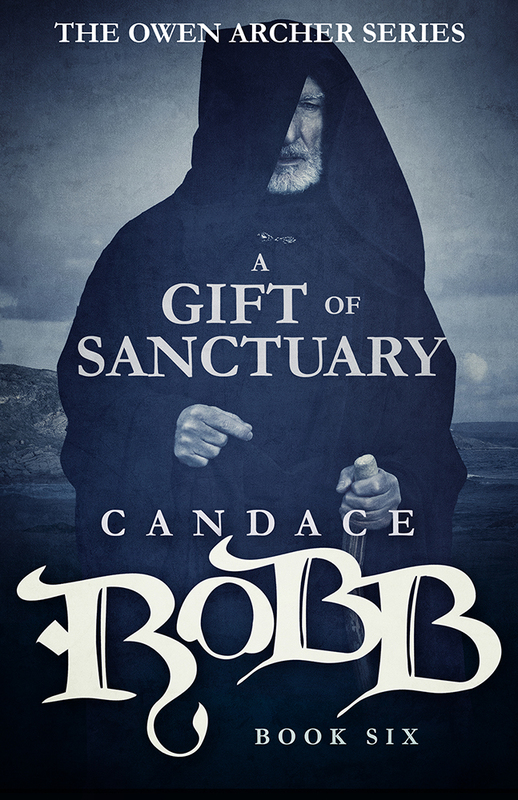 In The Nun’s Tale I used a true story from a history of St Clement’s nunnery to explore faith, relics, and the slow descent into madness. In The King’s Bishop I visited the Cistercian abbeys in Yorkshire and King Edward’s battle with the Pope over the bishopric of Winchester. The Riddle of St Leonard’s involved the plague, medieval hospitals and the concept of corrodians. With each book I learned more about the culture. 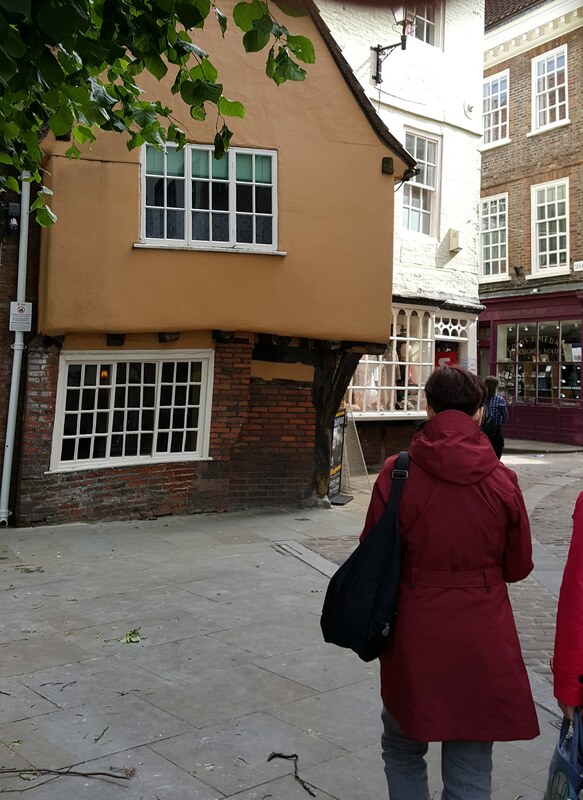 It felt rather like a virtual reality tour of 14th century Yorkshire and England at large. But I was still convinced that I was missing something in focusing on crime novels. 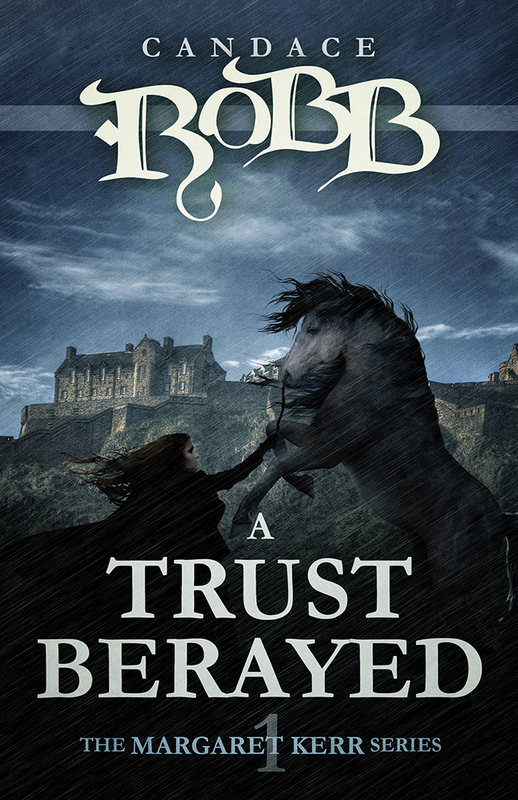 So after 13 novels in the genre I decided to try my hand at historical novels about women of King Edward III’s court, women with whom I’d become familiar by casting them in a few of my mysteries. I would first work with Alice Perrers, whom I felt I’d lazily used in the clichéd manner in which she most often appears. I meant to redeem myself. And then I would tackle Joan of Kent, whose complicated marital history baffled me. I imagined myself painting on an oversized, quite grand canvas, after working on miniatures for years. At first I did feel deliciously free—Alice’s story could take whatever shape I liked. But that sense of freedom quickly died. Because we do have some information about her, and even more about King Edward, Queen Philippa, and the court in which Alice moved, so it became a matter of connecting the dots, finding plausible and satisfying paths by which her life moved from one piece of evidence to the next. This was even more the case with Joan of Kent. Much to my surprise, my experience is that the members of the royal court led far more insular lives than the commoners in the Owen Archer mysteries. Though the influence of Edward’s court extended throughout the medieval west, the women of the court were largely restricted to interacting with courtiers, prominent members of the Church, and wealthy merchants. And their concerns, and therefore their stories, were centered in the court and the family. 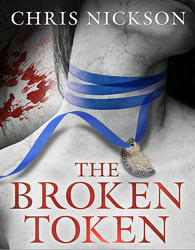 In my crime series, Owen Archer and the central characters, many of them women, interact with all levels of society, from archbishops and the royal family to alewives, bakers, merchants, and the hungry who gather at the gate of St Mary’s Abbey for alms, and in the course of an investigation Owen and those assisting him necessarily delve into detail of the everyday lives of this wide variety of people. And I’m the one who chooses with whom they interact. This reminds me of one of my favorite poems, which I have posted near my desk. The Joy of Writing by Wislawa Szymborska. I’d fallen in love with a world where I rule absolutely on fate. But I couldn’t change either Alice’s or Joan’s fates; well, I suppose I could, but that would defeat the very reason I’d chosen them—I wanted to better understand how they’d wound up as they had. Fortunately, before despair brought on writer’s block, I found a compromise. The parts of Alice’s and Joan’s lives that had made it into the record were, particularly for Joan, those that involved the powerful men in their lives. I wince in saying it, but it’s true. However—there were the quiet parts of their lives in which I had some leeway. I couldn’t stray too far. But I could explore plausible interactions outside the court. Why am I so obsessed with this—besides enjoying ruling absolutely on fate? Why can’t I be satisfied with tournaments, castles, battles, feasts, power plays amongst the nobles? Remember the phrase Kaveney invoked in her review of Little, Big, Dr Johnson’s comment on Jonathan Swift’s Gulliver’s Travels: “When once you have thought of big men and little men, it is very easy to do all the rest.” Is it possible that Johnson didn’t see the social satire and political commentary in Swift’s last chapters? Showing the big men and the little men (or women) is how a writer provides social and political commentary within the story. I wanted Joan and Alice to interact with all levels of society—because how they interact in such situations reveals so much about them, their ethics, and, often, their status, both real and perceived. For Alice I was curious about how a merchant’s daughter and widow, wealthy or no, would adjust to living among courtiers, waiting upon the Queen. And how would she have been received? I could show Alice in her native setting—merchant society in London—early in the book, then begin to blend the two. That contented me. Joan was a bit trickier. She’s a member of the royal family. I took advantage of Tony Goodman’s suggestion that Joan was with the royal family in the Low Countries in the late 1330’s, so that I could explore how she would react to the counts and dukes who, though not kings in their own right, were in most ways as powerful as her cousin the king of England. Even more interesting, I could play with what she would make of the captains of the Flemish cities, particularly Jacob Van Artevelde. I had fun with that. But the possibilities are limited. 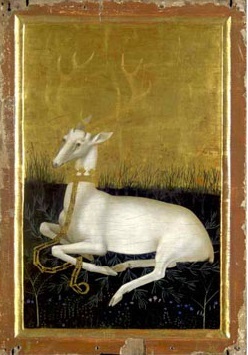 Consider all this research I’m doing about the keeping of dogs for the hunt; in a book about the royal court the kennels might be mentioned in passing, the dogs might interact with the characters on the hunt, one might even be a favorite companion. But in a crime novel I can spend time with the kennel workers, with the dog trainers, they can be main characters. And I can play with the common man’s attitudes about such pastimes—hunting that is more for sport than for sustenance. That books must be written to explain to the nobles the habits of the game animals because they live so apart from the natural world. 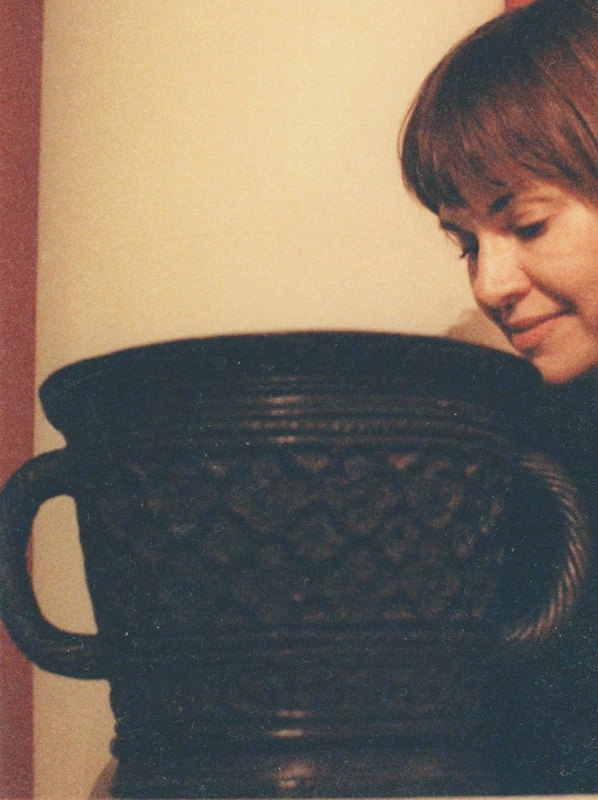 I’ve found a comfortable solution for myself—I’ll alternate genres, as much as possible. For I’ve discovered my own prejudices in writing about nobles and royals—I find their attitudes much more difficult to internalize than the attitudes of the common folk. Who knew I’d hate being a princess? But this discomfort has taught me a lot, has forced me to think harder about why they behaved as they did, why they so protected their status, and what they found threatening about free-thinkers amongst the rabble. It’s broadening my horizons, and enriching my virtual reality experience of 14th century Western culture. Little, Big. Those seemingly small-minded nobles have depths I’ve yet to sound. 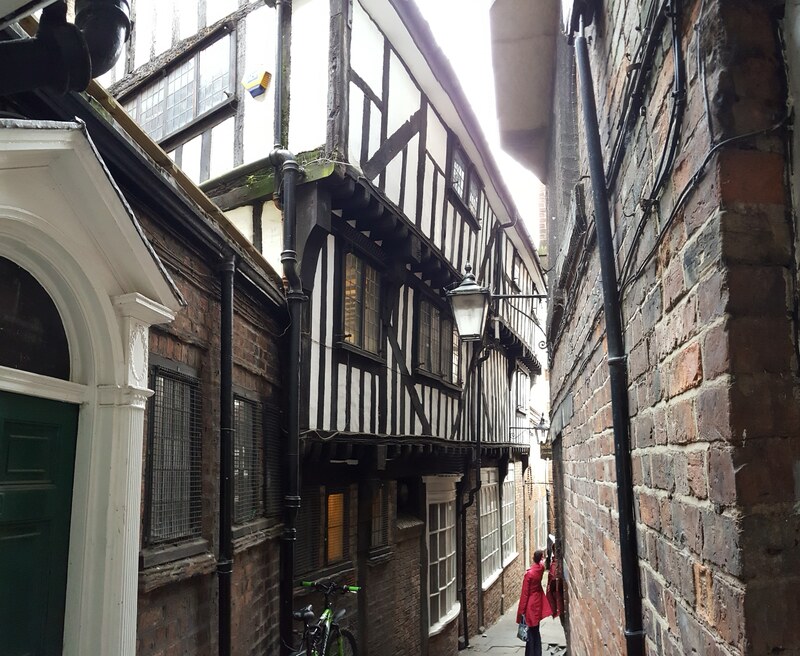 And Owen Archer will still prefer sitting in the York Tavern drinking ale with Tom and Bess to hobnobbing with his friend Chaucer’s masters. “Wit and Terror: A Little, Big Review”, Books and Bookmen 1982.